The main advantage of the WooCommerce integration is that allows you to use their payment gateways, send invoices and include taxes for your services. In order for this integration to work you will need WooCommerce product that can serve as a connection between WooCommerce and the Amelia Booking plugin. The first thing you need to do is install the WooCommerce plugin in your WordPress, if you haven’t already. After you finish the installation go to the “Settings” page, open the “Payment” settings modal, and enable the WooCommerce option. Once you enable the WooCommerce option, other payment methods will be disabled since WooCommerce supports the same payment methods. Once you’ve enabled the “WooCommerce” option, a WooCommerce product will be created automatically, and a new section in the WordPress panel will appear below the WooCommerce product. This Product provides the necessary connection between WooCommerce and Amelia plugin. It will not, however be visible to your customers. The default product name is Appointment, but you can change it by going to the “Product” page, click on the product, and change its name. Now you have the basic WooCommerce booking set up. 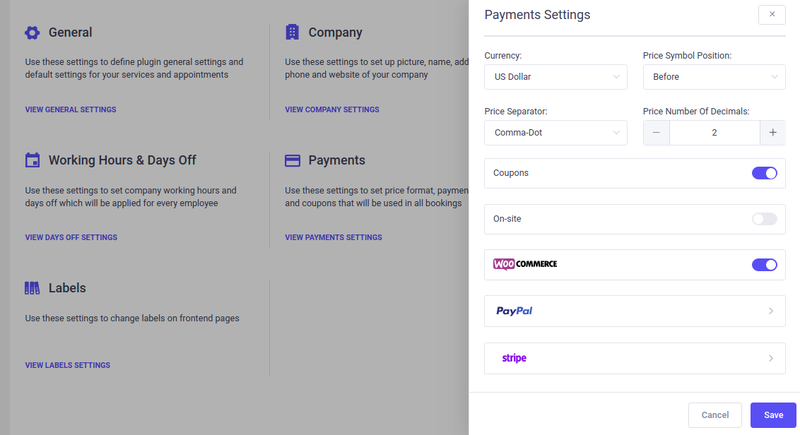 After setting the product, you can set the Tax and/or invoice option, or if you don’t need either of these options, you can start using the WooCommerce payment methods. Please note: If you enable WooCommerce your customers will not be able to use the Add to Calendar option at the end of the booking process because they will be redirected to the WooCommerce cart. To add tax click on the “Settings” in WooCommerce, and then open the “Tax” tab. Configure the tax settings as you need to, and click “Save changes”. Having done that, open the “Standard rates” page in the Tax tab, click on the “Insert row” button, enter the rate you want to be applied for your services in the Rate % cell, and enter a Tax name and any other information you need. Then click Save changes and your rate will be applied for all future bookings. If you need to send invoices to your customers, you can do so with WooCommerce. You simply need to change a single setting. Go to the “Orders” page in WooCommerce (if you don’t have orders yet you’ll need add a new one to set this setting. If you’ve already used WooCommerce, simply open an existing order. Once you’ve opened the order, on the right side you will see “Order actions“. Click on it and choose “Email invoice/order details to customer” and click on the “Update” button below it. Now that you’ve set invoices, when a customer schedules uses the WooCommerce appointments option, they will automatically receive an invoice via email.